Twitter announced couple days ago one of the smartest moves that they could have possibly done. They will be adding latitude and longitude to their tweets. 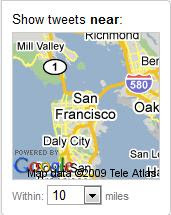 The first step will be through their API so that all the applications in the twitterverse can post tweets with location. In the future they'll also allow it from their own channels. This addition totally deepens the gap between traditional web search and real time geo search. There is an ongoing battle in the search world and Twitter is already beating the traditional search when it comes to real time events. If you wanted to know information about Michael Jackson, a political movement in Iran or an earthquake happening right now somewhere in the world you definitely would benefit much more from searching in twitter than doing so in Google or bing. 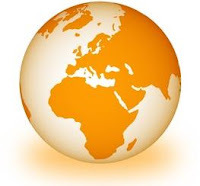 The geographical search will bring one more layer to our virtual world. Now, not only can you ask twitter what's happening right now around some tag words, but you could also limit the scope to some particular geographical area. Our syncing between the real and digital world will have location connection in addition to time connection once this technology is widely adopted as it will. As GPS enabled devices are becoming more mainstream this kind of search will become very important. This is the connection in real time and in situ. This is revolutionary! We'll open many other ways of doing things because of this new geo-layer and it makes total sense that Twitter will be at the heart of it all. Other than navigation tools, GPS has been pretty secluded for niche applications seldom used massively. With twitter geo-location addition plus the ubiquity of mobile devices with integrated GPS we'll see an explosion of new uses for location based applications. I can see it being used for sharing during events such as concerts, congresses, conventions, exploring new friends/hangouts/dates, getting discounts/coupons/sales information as you are at stores or malls, emergency uses of all sorts, etc. There's obviously a great business model behind this new Twitter feature, as once you have location targeted ads become a must. Foursquare actually already uses them in some capacity.